The lab's genetic, chemical and biochemical characterization of hypostatin, a new cell expansion inhibitor, showed that this molecule is a pro-drug that requires in vivo glucosylation to be converted into a biologically active form. 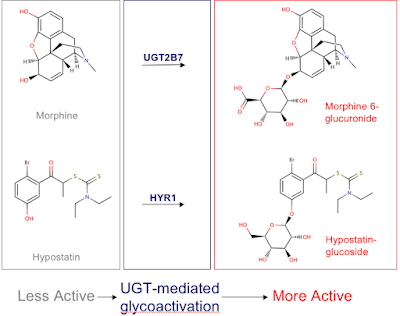 Many pharmacological and agrochemical agents are administered as pro-drugs, but what makes hypostatin unique in comparison to other pro-drugs is its activation by glucosylation, which we have named glycoactivation. There are relatively few clear precedents in the literature for glycoactivation. It is well documented that morphine-6-glucuronides, which are metabolites of morphine found in serum, possess much higher potency than morphine itself. There is debate as to whether these metabolites are the main pharmacologically active effectors of morphine action in vivo, however. Nonetheless, it is clear from examples like morphine and hypostatin that sugar modifications can increase the bioactivity of molecules after their uptake into mammals and plants. Many natural products are glycosides and in several cases their sugar residues play important roles in mechanism of action. In spite of their pharmacological importance, glycosides are virtually non-existent in the commercial small molecule screening libraries used by both academic and industrial labs to identify new drug leads. 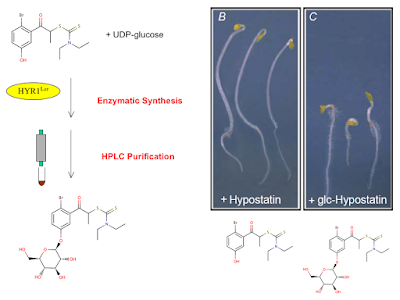 A project underway in the lab exploits UGT-mediated glucosylation and glycoactivation as tools for the synthesis and identification of new bioactive glucosides from existing small molecule screening libraries.